We love to hear stories about your experiences with FN products and appreciate your feedback. I want to say thank you to FN for making quality firearms and weapon systems. I spent almost 13 years in the US Army as an Infantryman and in that time I had deployed 4 times to Iraq in defense of our country and the freedom of the Iraqi people. I was a mounted M240B truck gunner all 4 tours (the job I loved the most) and I can honestly say that the 240 and M249 SAW have gotten us out of quite a few situations. In fact our first tour in Iraq in 2004 we found an original M240B from Belgium (with the knobby charging handle) buried in the desert by the Iraqi Army. We brought it back to our camp and our armorer grinded the rust off the receiver, ordered new internals, re-blued, kept the original wood stock, and changed the barrel. It was an awesome project and we used it for the rest of the deployment. Long story short, it was during my fourth tour I had the opportunity to work with Special Operations (again) and was privileged to shoot and train with the Mk16 SCAR, needless to say I fell in love. It was after I was medically retired from the Army in 2015 my wife wanted to get me the best Christmas present ever, she bought me a SCAR 16S. I can honestly say it brought me back to a lot of memories, but most of all every time I shoot, look, clean, or even just mention my rifle it helps me remember what FN has done for me and my brothers, and what it has has done to bring us home. If I can trust FN with my life and the lives of those around me, then I trust it to protect my home and family. I started out with a dual-column pistol from a high-end German manufacturer – what is often billed as The Mercedes Benz of firearms. It was over-engineered, heavy, and while the grips practically formed to my own hand, they bit into my side. Between the weight and the comfort I found myself rarely carrying it for defense – which was the intended purpose. When I got my FNX-9/40 my problems were solved – all of them. It had identical capacity, was much lighter, and I adapted to the DA/SA trigger much better. And the proportions of the frame and grip were perfect for a large high capacity sidearm for concealed carry. I grouped better at several distances right out of the box. Because of the weight and comfort I now carry it all the time – which is the point of defensive carry. The so-called Mercedes is now a range gun for me. Thanks FN. Best handgun I’ve ever owned. I trust my FNS .40 to protect my family and myself. I trust my FNS .40 to protect my family and myself. I purchased mine when they first came out and since day 1, it hasn’t had even the slightest of hiccups. The design, with its low bore axis and superb balance have since moved it to the front of the line as my favorite sidearm- by far! I’ve since sold my before coveted W.German SIG P228 as it had more perceived recoil than my FNS .40 (and it was a 9mm!). Needless to say, I’m a huge fan of FN. FN works every time and I know that I can depend upon that. I bought my FNX 45 after having carried and owned an HK USP. My FNX has held strong. 3,200 rounds down range and not a single malfunction or jam. 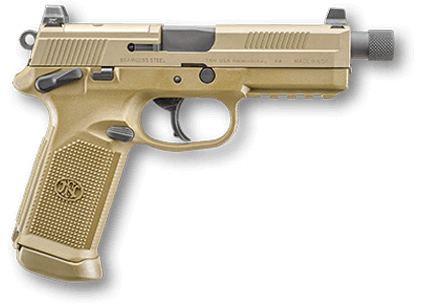 I know if the day ever comes where I am forced to make the decision to use it my FNX will perform exactly how I need it to. I work as private security for a firm that deals a lot with bad situations and knowing my gun will work when it counts is a big deal to me. I pray the day I need it to perform never comes. Thanks FNX for the best gun out there. I would trade it for anything else out there. Someday it may save my life or another’s. Best buy on the market! I would definitely recommend FN firearms to anyone. Being a NRA pistol instructor, I like to have a variety of firearms & calibers available for my students to try when we get out on the range. I would have to say my FNS-9 that I purchased through your instructor program a few years ago is my most popular firearm, especially among new women shooters. I have seen new shooters who could not hit the target with their revolvers, but hand them the FNS-9 and they consistently will be hitting a 6 paper plate before they leave. It is light weight, little recoil, great sight picture & very accurate. I have to say the FN Five-seveN is the best pistol to train youth shooters who want to learn how to shoot pistols. I have one granddaughter who is not into firearms at all, except for my Five-seveN. She doesn’t want to shoot any other pistol, rifle, or shotgun, but she sure does get excited whenever I bring out the Five-seveN. I have to also add I have never had any jams, misfires, or any other issues with any of my FN firearms. I would definitely recommend FN firearms to anyone. By completing this form and submitting your story, you are giving FN America permission to include your first name, last initial, city, state and your story on this website and/or marketing material without compensation. You also acknowledge that FN America may edit, use and publish your story, that it is your original work, and that FN's use will not violate any third party's rights. Submissions will be reviewed and not all will be posted and will become the property of FN America, LLC.